Can I Play Flash Games on an iPad or Android Device? It turns out Apple has been fighting with Adobe, so you can't view Adobe Flash SWF objects on your iPad normally. On major browsers like Safari and Chrome, you'll see a blank spot where the flash game should be. Game options include full-screen "Theater" mode, Mouse Trackpad, Keyboard, and on-screen Gamepad with programmable buttons. Below are some tips on using the Puffin browser to play the flash games on an iPad, using the games on my website as examples. Activating the full-screen mode is easy: Open the flash game, then slide open Puffin's side-swipe menu from the left or right side of the screen, and then press the Theater icon. The game should expand and fill your iPad screen. When you're ready to exit the flash game, first close Theater mode. This redisplays the 'X' (Close) button in the upper left corner of the game. No mouse for your iPad? No problem. The Mouse Trackpad in the Puffin browser puts a virtual mousepad and pointer right on your screen. Use the Mouse Trackpad to play any flash game you would normally play with a mouse. To activate the Trackpad, first open the flash game. Then open Puffin's side-swipe menu and press the Trackpad icon. A Trackpad (mousepad) appears on screen. You should also see a white mouse arrow. To move the arrow, slide your finger on the Trackpad. To click the mouse, move the arrow into position, then tap the Trackpad. In the image above, I'm playing 3D Logic on my iPad Mini using the Puffin Trackpad. 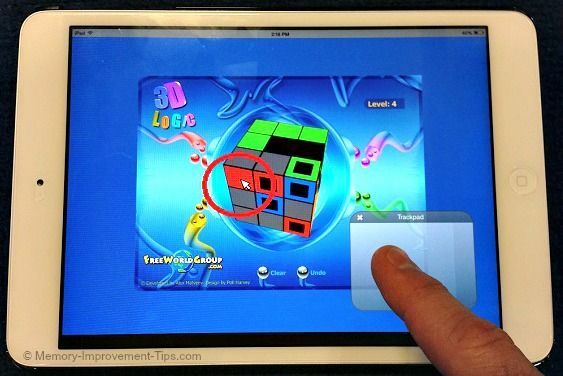 To rotate the cube, I slide my finger on the Trackpad with the pointer hovering over the cube. To select (click) a colored square, I slide the arrow over the square then tap the Trackpad. Pressing the Keyboard icon displays a standard iPad keyboard. The keyboard is useful for flash games that involve typing letters or numbers. Brain Racer, a math game, is one example. To display the keyboard, open Puffin's side-swipe menu, then press the Keyboard icon. The keyboard displays below the game. TIP: If the keyboard covers part of the flash game, rotate your iPad vertically into portrait mode. 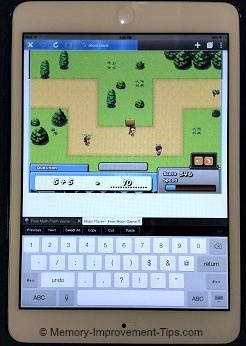 This makes the game smaller but frees room on screen to display both game and keyboard without overlap (see image at right). To be honest, I haven't had much luck playing flash games that require fast typing. The iPad's hunt-and-peck keyboard is just too awkward and slow compared to the typing speed I get on an actual keyboard. For high-speed typing games, such as Typing Tidepool, stick with playing them on a real keyboard and PC or Mac. Some flash games require controls for both movement and keyboard. 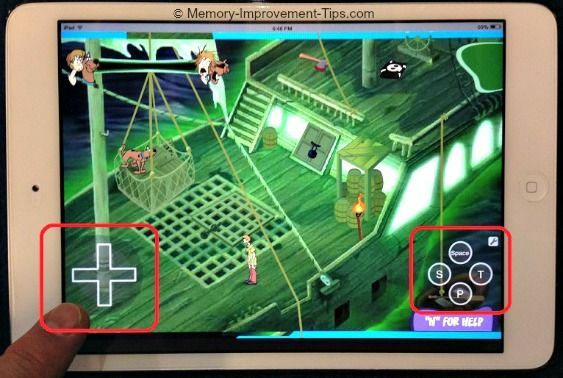 To play those flash games on your iPad, use the Gamepad feature in Puffin. The on-screen Gamepad combines an Up/Down/Left/Right movement controller with 4 programmable buttons. Above, I'm using the Gamepad to play the Scooby Doo: Pirate Ship of Fools flash game on my iPad Mini. Circled in red are the two parts of the Gamepad controller. The first part, in the lower left of the screen, is a four-way movement controller. The second part, in the lower right, is a group of four programmable buttons. To display the Gamepad controller, first open the flash game. Then open the Puffin side-swipe menu and press the Gamepad icon. Movement Controller. The four arms of the cross-shaped controller in the lower-left are pre-assigned as Up, Down, Left and Right movement buttons. These controls are useful in flash games where you need to move a character through a maze or other scene. For example, in the Scooby Doo game above, I'm using the movement buttons to walks Shaggy and Scooby through the pirate ship. Programmable Buttons. The four round buttons in the lower right are pre-assigned as Up, Down, Left, and Right movement buttons, but they can be changed. Click the wrench icon near these buttons to display a list of possible values. For example, as described in the Scooby Doo game's help screen, there are several keyboard commands used to perform actions during the game. The help screen says to press the 'S' key to save the game, press 'T' to select from inventory, press 'P' to pause the game, and press Spacebar to perform actions on the ship. To reassign buttons, click the wrench icon next to the buttons to enter Edit mode. Then click the first button you want to program. This displays a list of possible keyboard commands that you can assign to that button. To assign a keyboard function to the Gamepad button, simply tap the function in the list. For example, from the help screen in the Scooby Doo flash game I knew that Spacebar was for actions. So while editing the top button, I tapped on Spacebar in the list. After you practice with the Gamepad a few times, you'll see that it's intuitive and not difficult to program. There was a time when I thought there would NEVER be a way to play flash games on the iPad. So I'm grateful for browsers like Puffin that now enable iPad owners to play flash games on their portable Apple devices. Having said that, slow response time and lag during game play can occur. Whether these are minor issues you can ignore or severe enough to make the games unplayable depends on your iPad's processor, your internet connection speed, and other factors. If you find playing flash games on your iPad overly frustrating due to poor Flash performance, my suggestion would be to first try playing slower-paced flash games like board games or card & tile games before you give up. The developers at Puffin and other related browsers are working to improve their Flash support. So I would expect the performance of Flash on the iPad in these browsers to get even better over time. If you see a blank screen on your Android phone or tablet when opening the free flash games on Memory-Improvement-Tips.com, try opening this site in the Puffin browser as described above. There is a free version of Puffin in the Google Play Store as well as a paid version.